Which brings us to this recipe for Kachin Chicken Curry. The technique reminded me very much of the technique Charles Phan taught me in my book to make his steamed chicken dish. In both cases, you combine raw chicken–which you cut into 2-inch pieces–with flavorful things and then cook them all together either in a steamer or, in this case, right in a Dutch Oven on very low heat. That’s what it looks like when it goes in: that’s chicken with garlic, ginger, salt, dried red chiles, ground coriander, turmeric, a little water and a little oil. Put the lid on, turn the heat on low and cook for an hour. It’ll come out looking like this. Ok, now you know why I led with the image that I did: this is not a very pretty dish. But here’s what happens: all of those flavors infuse the chicken and the chicken makes its own sauce. So all you have to do is scoop it on to rice and you have dinner. Duguid recommends scattering it with scallions or coriander but I only had limes, so I went with wedges and a little parsley. 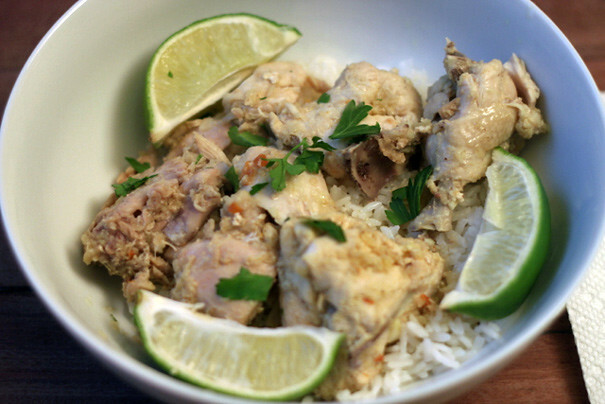 The flavor is subtle (if you want the extreme version of this kind of dish, try Chicken Adobo) but comforting and it makes for an easy, exotic weeknight dinner. Just mix everything up, put it in a pot and turn up the heat. The rest takes care of itself. Summary: From Naomi Duguid’s Burma. 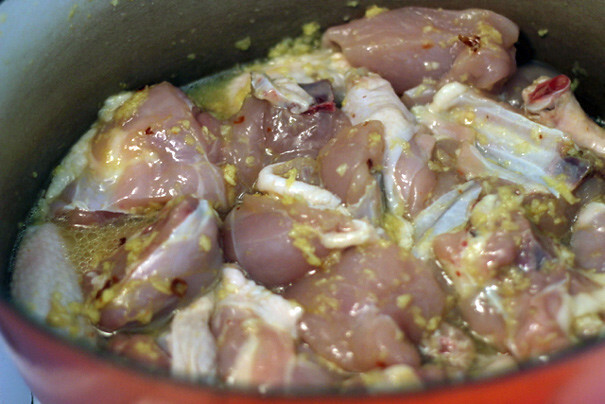 Rinse the chicken pieces, remove most of the skin, and set aside. Place the chicken in a wide bowl. 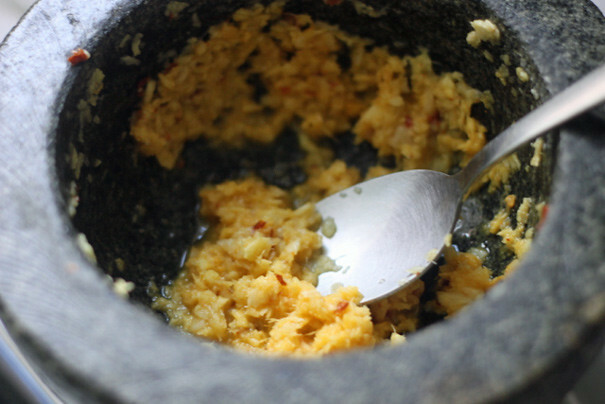 Pound together the garlic, ginger, salt, chiles, coriander, and turmeric in a mortar to make a paste. 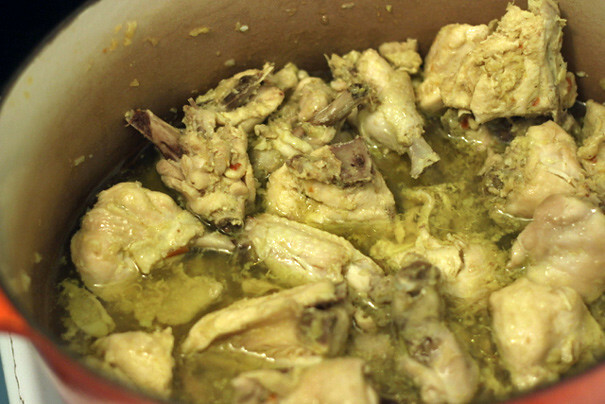 Stir the water into the paste and add it to the chicken. Turn and mix the chicken and paste until the pieces are well coated. Add 2 tablespoons more water and the oil to the chicken. Place in a wide heavy pot (I used a Dutch oven) with a tight-fitting lid, add some of the reserved skin, and stir to mix well. Place over medium-low heat, with the lid on, and bring to a simmer. Reduce the heat to low and cook for 1 hour or until all the chicken is cooked through. The chicken will be bathed in a light sauce and should be tender and succulent. To serve, remove the skin and discard. Serve over rice with a sprinkling of the scallions or cilantro. Don’t Be A Nut, Meg, Make Nutmeg Chicken!